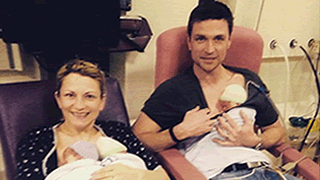 ABINGTON, Northhampton – A former Olympic gymnast in the UK who refused her doctors’ advice to abort two of her unborn children due to health concerns and risks has given birth to triplets. As previously reported, Jaime Halsey, 35, and her husband Steve found out that they were expecting triplets in October and were referred to specialists for further care. But because doctors believed the babies were at risk for Intrauterine Growth Restriction (IUGR) they advised that the Halseys consider selective reduction. Doctors said that they had concerns over Halsey’s health as well. But Halsey said that abortion was out of the question. The Halseys and their newborn triplets. On February 24, Halsey gave birth via Cesarean section to three healthy baby girls: Eden Rose, Amber Joy and Erin Aila. Eden weighed three pounds, eights ounces, Amber weighed three pounds, one ounce, and Erin weighed two pounds, thirteen ounces. ‘‘I felt so overwhelmed; I had heard each one cry and been able to see them. It was just the best feeling ever!” she wrote in blog post following their delivery. The girls will remain in the hospital for some time as they will need time to grow as premies, but are otherwise doing well, Halsey said. “We both know that the triplets have a long way to go, and many hurdles to get over before we can bring them home; but we know that we have given them the best chance possible and the wonderful medical staff at the JR have and will continue to give them the best chance possible too,” her husband added. Jaime Halsey, then known as Jaime Moore, was the UK’s first female trampolinist to appear in the Olympics, performing at the 2000 Olympic Games in Sydney. She married Halsey, a professional rugby player, in 2009.